Examples from Whole Foods Market (WFM) and Reynolds American, Inc (RAI) show you what to do (or not) to trade successfully with Elliott. After 20 years of experience applying Elliott wave analysis in real markets, our Senior Analyst Jeffrey Kennedy says that it remains the only tool that will tell him -- down to the tick, to the pip, even to the penny – when his forecast is no longer viable. "Don't pick tops and bottoms"
See the logic behind Kennedy's wisdom by reviewing these two timeless lessons from his Trader's Classroom service: Whole Foods Market, Inc. (WFM) and Reynolds American, Inc. (RAI). Then, see how you can get more free lessons during Kennedy's popular Trader Education Week, going on now! Additionally, we had a double closed-key reversal when the low was made, as well as some bullish divergence on the smaller timeframes. Price evidence was very strong that this market would continue to new all-time highs, so my outlook was bullish. 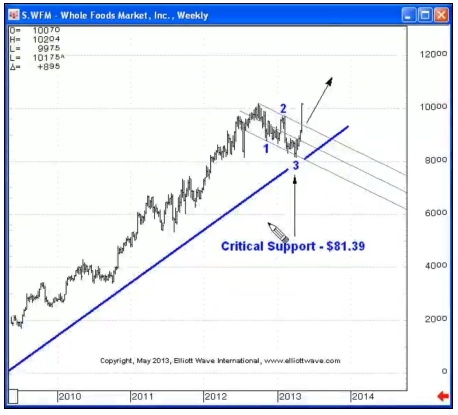 The bullish outlook in WFM required the April low of $81.39 to hold. 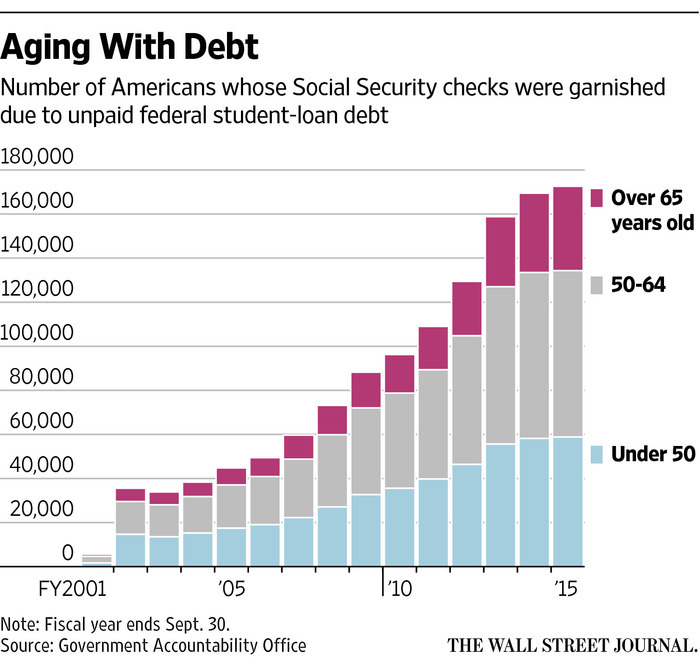 The trend was clearly up from 2009 into 2013. 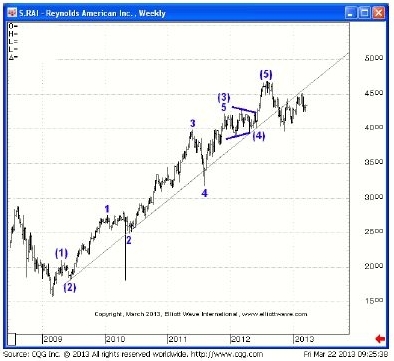 From an Elliott Wave perspective we knew that this was a countertrend move with an A-B-C structure (a corrective wave pattern within a larger trending market). We had the wind at our back and were not "picking a top." We simply looked at the price evidence in support of a further rally. Conversely, the following example in Reynolds America, Inc. did not work out. 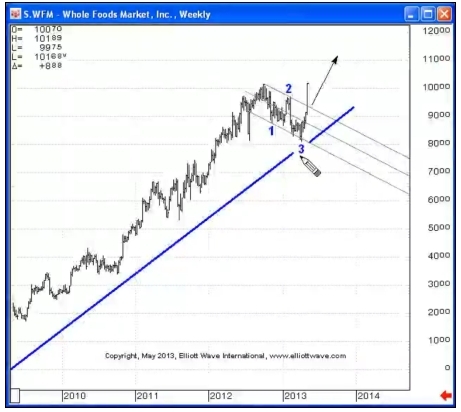 Unlike the successful WFM example, I was not trading with the trend. Instead, I was looking for a "top." Yet I was able to prevent a losing trade from becoming a devastating trade because I could use the Elliott Wave Principle to "know where I was wrong." 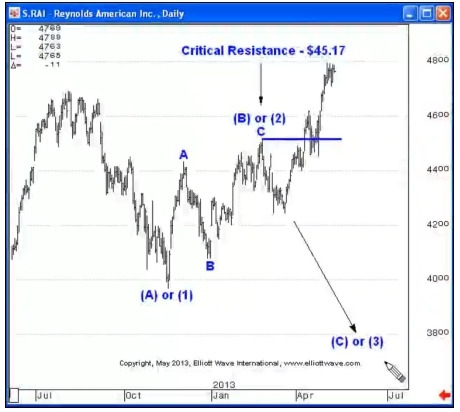 This bearish wave pattern was viable only as long as prices held below the February high of $45.17. This article was syndicated by Elliott Wave International and was originally published under the headline The 2 Most Important Keys to Successful Trading. EWI is the world's largest market forecasting firm. Its staff of full-time analysts led by Chartered Market Technician Robert Prechter provides 24-hour-a-day market analysis to institutional and private investors around the world. So how can you pack up the whole family and also make sure that Fido has a happy, healthy, and tail-wagging good time? Was your pup’s last 'road trip' a trip to the vet? Before your trip, take him on a short ride to the park to make the car a place where fun things happen, too. Make your dog's travel crate a happy place by doing a “test crating” and rewarding Fido with lots of his favorite treats. Soon, he'll be drooling when he crawls inside. Just like humans, dogs feel most peaceful in a calming environment, so give your dog a back rub and play soothing music while you're driving. Because dogs like familiarity, bring along their snuggly blankets and favorite toys. On arrival, set up your dog's crate and keep your feeding and walking routine. While on a trip, it's even more important to reward your pup for good behavior. Treats build positive associations with new sights and sounds. For the first time since 1888, a rare calendrical phenomenon will mean Thanksgiving and the first day of Hanukkah fall on the same day, making for some a once-in-a-lifetime event. In a rare convergence of the calendar, Thanksgiving and the first day of Hanukkah, the eight-day Jewish festival of lights that typically commences close to Christmas, fall on the same date in 2013: Nov. 28. And Thanksgivukkah has become a bold platform for expression, with creations ranging from sweet-potato latkes to the "Menurkey." Once in a lifetime, the candles meet the turkey. How excited will people get over the idea of lighting candles and eating turkey and stuffing on the same night? Thanksgivukkah isn't set to happen again for potentially another 70,000-plus years. The "Menurkey" is a menorah made in the shape of a turkey. While Hanukkah, which commemorates a Jewish military victory over Greek forces in the second century B.C. and the miracle of a day's worth of lamp oil lasting for eight, is technically a minor holiday on the Jewish calendar, it has become increasingly prominent in the past century as part of the broader seasonal push. That has happened only once before—in 1888—according to those who track the Jewish calendar. And it is one that isn't set to happen again for potentially another 70,000-plus years. The reason the hybrid holiday is such a rarity owes to the nature of the Jewish calendar, which is partly influenced by the lunar cycle and doesn't correspond on a consistent basis with the Gregorian or Christian calendar. Making matters more confusing is the fact that Thanksgiving's place on the calendar has also moved since the federal recognition of the holiday by President Lincoln in 1863. For many years, it was observed on the final Thursday of November, as opposed to its present incarnation on the fourth Thursday. Eli Lansey, a New York-based physicist who has studied the calendar convergence, couldn't agree more. "If ever there was a year for deep-fried turkey, this is it," he says. Most of us don't have enough reserve energy to fuel the super-productivity we may wish to achieve in the time available. This energy drain often stems from the growing societal demand to literally make every second count. According to a study from the Future Foundation (a London-based think tank), we are rapidly approaching a 24-hour society. "Information technology makes it possible to operate around the clock, increasing the pressure to do so," says an article in the Futurist. The result is increased customer demand to have services available at all hours. Coping with this frantic pace can be draining. 1. Get a check-up. Fatigue is a symptom, not a disease. Therefore, if you suffer from constant fatigue, a trip to your family physician may be a good idea. The causes of chronic fatigue syndrome (CFS) are not well understood. Neither are the treatments. However, as the name implies, those who suffer from CFS are chronically exhausted and need specialized medical attention. If you're wasting time every day because you're just too tired to concentrate or focus, see your doctor. There may very well be a medical reason for your fatigue. 2. Eat light and right. Big meals can make you sleepy. What is the reason? Depending on your diet, 50 to 80 percent of the energy produced by digesting food is consumed by the act of digestion itself. The more energy that digestion takes, the less energy the food provides the rest of the body. It takes more energy to digest cooked and processed food and much less to digest fruits, vegetables, grains and nuts. Try to eat more of the latter. They're easier on your digestive system and you gain more energy from them. 3. Reduce caffeine and sugar. Caffeine and sugar aren't particularly healthy. However, many people use both as short-term energy boosters--in moderation. Sugar has virtually no nutritional value. Eating sugar tends to rob the body of its nutrient stores. It also causes drastic swings in blood sugar levels, stressing the adrenal glands. Coffee, which can give you a temporary lift in energy, also weakens the adrenals. 4. Get enough sleep. Numerous studies indicate that most people need eight hours of sleep, yet an increasing number get far less. We are working longer, staying up later, and getting up earlier. Workers who sleep less so they can work more and get more done may in fact be accomplishing the opposite. The National Sleep Foundation estimates overtired employees cost American business $18 billion annually in errors and slowness, according to an article in Forbes. 5. "Finish every day and be done with it," advised poet Ralph Waldo Emerson. "You have done what you could. Some blunders and absurdities no doubt crept in; but get rid of them and forget them as soon as you can. Tomorrow is a new day, and you should never encumber its potentialities and invitation with the dread of the past. You should not waste a moment of today on the rottenness of yesterday." Please visit the Best of Boomer Blogs #321 this week hosted by Karen Austin at The Generation Above Me. Do you have arthritis, mental fog, aches, pains, lack energy or difficulty sleeping? Rather than suffering from age related conditions, in reality, you may have a reversible condition. Doctors call this condition chronic, unintentional dehydration. A better description is the nursing diagnoses of fluid and electrolyte imbalance. As we age, our thirst perception is impaired. We may think we are not thirsty yet the above symptoms are a few of the many cries for water our body makes. The solution to rehydrate is easy, simply drink more water and take in more salt, but only the right kind of salt. The salt helps the water get inside all of our cells where it can do the most good. You may constantly hear salt is bad for heath. Yet journals like Science, American Journal of Hypertension and JAMA (The Journal of the American Medical Association) have all published research showing the opposite. JAMA reported there was no strong proof that reducing salt intake will reduce the risk of heart attack, strokes, or death for those with normal or high blood pressure. A European study even found that those who ate less salt had an increased risk of dying from heart disease. The evidence of salt being associated with heart disease is weak. More importantly, the evidence is all base on iodized table salt. Refined table salt is 97.5 percent sodium chloride. The balance is man-made chemicals like anti-caking agents such as ferrocyanide and aluminosilicate. Instead of table salt, switch to unprocessed sea salt. It is about 85% sodium chloride and the remaining 15% is made up of naturally occurring trace minerals. These minerals are essential for health. As long as you do not have kidney disease, salt intolerance or you are not under a doctors care, try the water cures protocol tonight. For better sleep tonight, drink a glass of water. Once down, put a pinch of sea salt in your mouth and let it dissolve. On awaking, do the opposite. Put a pinch of unprocessed sea salt in your mouth and dissolve it totally. Then drink a glass of water. Drink it all at once, don't nurse it. Preferably, drink it within 20 min of getting up and 1/2 hour before you eat breakfast. Jonathan Steele, RN has a career that has taken him from hospital nurse, high tech pediatric nurse, hospice and now holistic nurse. Having used holistic health treatments in the hospital for over a decade, he is now in private practice. His specialities are pain elimination, anemia management and memory enhancement.